How do we reduce social prejudice? Given our diverse and multi-ethnic world, it is of great importance to understand ways to reduce social prejudice. In the 1950s, Gordon Allport introduced the intergroup-contact hypothesis. In this view, intergroup contact under positive conditions can reduce social prejudice. The necessary conditions include cooperation toward shared goals, equal status between groups, and the support of local authorities and cultural norms. Considerable research since then has supported these ideas. In a 2003 review, Stephen Wright and Donald Taylor also noted the effectiveness of identification with a superordinate group. In other words, different groups can come together as part of one overarching group, for example, as part of one community or of a common humanity. 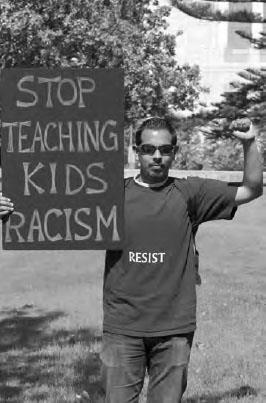 A man marches to protest racism in schools. Research shows that inter-group tensions can be reduced granting groups equal social status, sharing goals, and getting support from local authorities (iStock).